2019 off to a flyer! Thanks for a great 2018!! Thanks to all the lovely punters and even the not so lovely punters (you know who you are!) for coming to our shows this past year it’s been a blast. We’ll be back on January 7th 2019, just a short break. The last show of the year was super fun. A sold out venue to see us to the end of a top year of comedy in typical style. December 2018! Last shows of the year! Email bookings@cafelounge.com.au to reserve a table! In case you haven’t guessed we are really crap at keeping the website up to date! Anyways, we just turned 7 (I miscalculated on the poster!)! There’s a bunch of fun shows coming up in October and for the rest of the year! 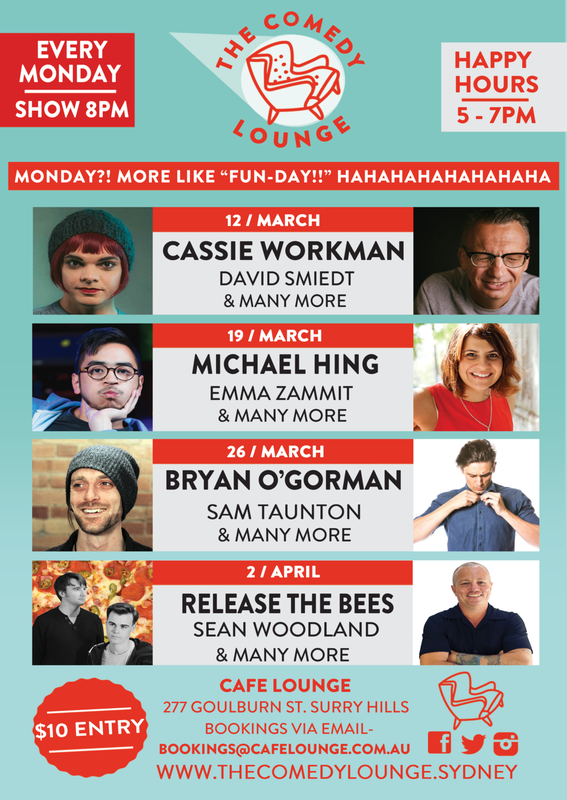 And Cafe Lounge has some interesting comedy stuff coming up besides our fun little showcase! Stay tuned for live podcast vibes and other fun shows! This rock keeps turning and the shows keep coming, one a week every Monday Night... Sold out or near enough every Monday. Tickets on the door, come down. Earlier the better. What do you get when the cast and crew behind cult ABC comedy chat show the John Conway / Aaron Chen Tonight show put on a show without the cameras? Pure unhinged, unadulterated madness. Event details on Facebook here. Look at this! LOOK AT IT! WITH YOUR EYES! Line ups for May. Comedy festival is in town so expect some real great drops in from around the world. Headliner Show this Sunday 25th March! 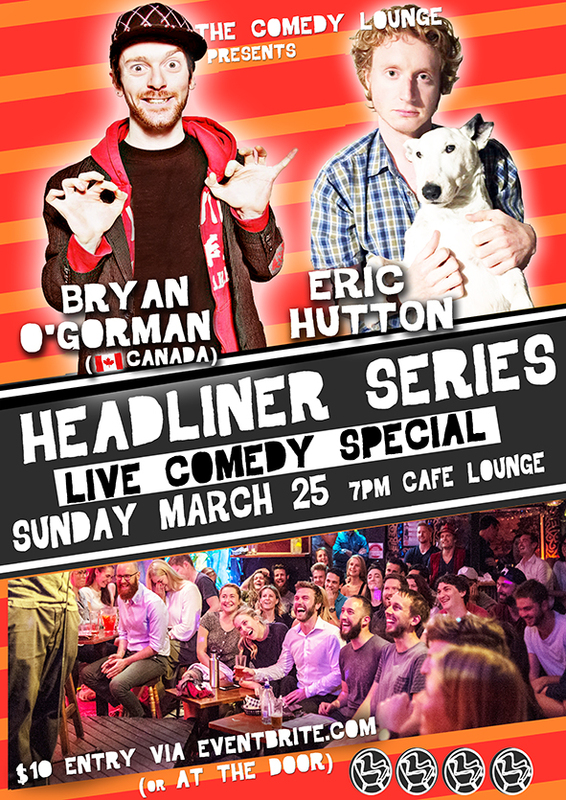 Here's a snippet of the excellent Bryan O'Gorman (CAN) one half of our second special feature, starring two genuine favourite headliner acts doing extended spots. Tickets are just $10! Check video below of Bryan, he very good. Tickets Button Above x.
Email bookings@cafelounge.com.au for table reservation action!